I have yet to read a Kate Quinn novel I didn’t like. 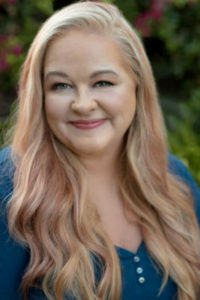 She has a sure touch for developing relatable characters and putting them into exciting situations. Quinn’s skill pulls the reader from page to page and ensures reluctance to put the book down. The Huntress delivers that magic in this tale of Nazi hunters in post-WWII. The “present” story-line is mostly told from British former war correspondent Ian Graham’s point of view, covering a seven month period from April to October 1950. Deeply damaged by his experiences in the war and coverage of the Nuremberg trials, Ian gives up journalism to become a Nazi hunter. His partner is an American ex-GI (and one-quarter Jew) Tony Rodomovsky, who spent the war as an interpreter and has something to prove. He uses his charm and language skills to great effect. They are joined in their search for a Nazi known as the Huntress by Graham’s war bride Nina Markova—the only known person who had faced the murderer and still lived. Nina was my favorite character—a thorough barbarian raised as a wild child in remote Siberia. Her fictional history (based on true events) is told in a separate story line in chapters covering her flying career in the fabled regiment of Soviet women bomber pilots known as the Night Witches. Nina is contrasted with the Huntress. Both are hard, pragmatic, survivors and killers, but Nina is constrained and elevated by her lovers and friends. Nina, Ian, and Tony track the Huntress across the Atlantic to Boston where they meet Jordon McBride, a young woman who wants to be a photographer. In typical 1950’s fashion, Jordon has put her dreams of college and a career on hold out of deference to her father’s wishes and the expectations of her boyfriend. Early in the book, Jordon McBride’s story is set in the summer of 1946 where we meet Jordon’s step-mother, a German refugee with a sweet four-year-old daughter. It then skips into the present story-line in May 1950 with Jordon working in her father’s antique shop and reluctantly planning her fall wedding. Quinn juggles these alternating timelines and backstories with consummate skill, weaving the narrative so that the reader is always clear what is happening and when. She carefully builds her story and characters. Her craft also shows in meticulous historical details and deft use of themes. The reader feels the cold and danger of flying in an open cockpit plane to drop bombs on the Eastern Nazi front; learns about the difficulty and tedium of hunting war criminals during a time when everyone wants to forget the war; and suffers the disappointment of a talented young woman told over and over that her skill at photography is just a hobby and she should be happy to “settle down” with her high school sweetheart. These individual narratives are linked by big picture themes: vengeance vs. justice, the redemptive nature of love, overcoming crippling fears to move on in life, and the banality of evil. This last item brings me to the title character. 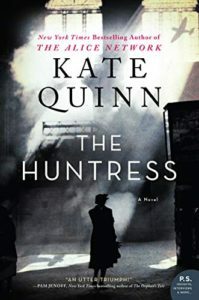 Throughout the book, the Huntress is deliberately shadowy/opaque. In the opening Prologue, set in 1945, she realizes she has become the hunted. She makes her excuses: her crimes were legal under Nazi law, her murders were mercy killings, many did much worse. She makes the decision to hide until the storm of vengeance passes. A news article by Ian Graham details her crimes and sets up his obsession with finding her. As a reader, I couldn’t get a handle on the Huntress and her motivations. After reading Quinn’s Author’s Note, I understood why. The Huntress is based on two actual women convicted of Nazi war crimes. Quinn said, “After long hours researching both women, I am still at an utter loss to understand why they committed the crimes they did.” Having a shadowy figure as the antagonist worked for most of the book until the climax. At the point vengeance was taken or justice was served (I won’t spoil the moment! ), I felt vaguely dissatisfied. That said, I found the action-packed climax thrilling. It was only after my heart quit racing and my breathing slowed that my mind took over and asked the questions: What effect did the climax have on the Huntress? Did she feel aggrieved, defiant, justified, relieved…? Was she a banally evil woman “going along” with the Nazi regime or was she a purely evil psychopath given free rein? Or was she something more complicated and nuanced? Knowing that, would have added an additional layer of understanding/satisfaction to the last couple of chapters. Not knowing didn’t spoil the book. I found The Huntress a very satisfying read. Highly recommended. Note: I received an advance reader’s copy of this book from the publisher in exchange for my unbiased review.